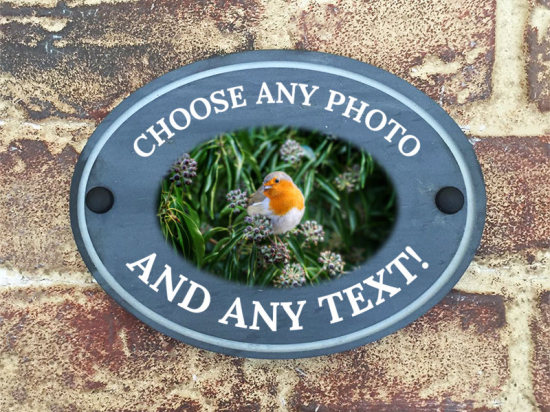 A wonderfully unique slate sign for your home, featuring your choice of image! The image is printed using our UV ink printer, with the ink bonding to the material giving it a bright, vivid and lasting image which contrasts beautifully against the slate. You will be then prompted to enter select the position for the text. The options that appear will depend on the shape you have selected. The final step will allow to change your lettering colour and enter any special requirements you may have. If there is a specific image reference please enter that in this box! Type in the box below to search for a design you would like on your slate sign. Perhaps you have a favourite scene or animal in mind that you would like printed on your sign. Please enter your sign details and select an image to see a live preview. A wonderfully unique slate sign for your home, featuring your choice of image! The image is printed using our UV ink printer, with the ink bonding to the material giving it a bright, vivid and lasting image which contrasts beautifully against the slate. Since 1989 we have been producing bespoke hand painted house signs from our workshop in Hertfordshire. Each of our house plaques is cast as one piece in polyurethane resin and individually hand painted by our talented artists.